For the last few years, REV’IT! has been trying to get their “American” offering of jackets where the sizing is consistent with most other manufacturers. When they first started selling in the US, they sized their alpha sized jackets so that they fit about one size smaller than anybody else. In the last couple years, they’ve corrected the issue and now their jackets fit as most people might expect. But with this Shield jacket, unfortunately they have taken a step back and this one fits like the original sizing chart which will be about one size smaller than you might expect. And for most people, that means you’ll have to buy one size larger jacket than you normally wear in men’s clothing. I’d highly recommend you use a tape and measure yourself and then use the chart to choose the correct size. The overall fit of this jacket is trim… some call it a “European” cut, which means it is close fitting and will work best for those with a trim build. We put a Medium and XL on our two Fit Check mannequins Huey and Dewey. We generally buy test jackets in a Medium for Huey and an XL for Dewey (41” and 45” chest respectively) assuming these jackets would fit “normally”, and we were able to get them on the two mannequins, but it was a very tight fit (click the “View Larger Images” link above to see). Below is the REV’IT-published chest sizes for each jacket alpha size along with our estimate of max waist/belly. We include a waist/belly measurement because if you have some belly, then you will want to make sure you are buying a jacket that is large enough to accommodate you. Those with a waist that is trimmer than the chart indicates for their chest size can use the adjustment straps to customize the fit with no problem. A jacket like this looks great with the waist adjusters in a bit. With this jacket, we see that the jackets don’t taper a lot so the belly issue won’t be a problem for most. 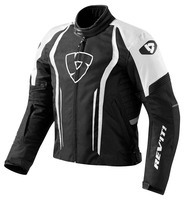 Just last week I reviewed the Raceway jacket by REV’IT! and I thought I was seeing double when I got my new Shield jacket. Aesthetically, they look practically identical, but on closer inspection, I see that this Shield jacket is a textile shell with a waterproof barrier built in and with a removable thermal liner, so this jacket is set up for cold to mild weather and wet weather. The Raceway is a textile shell with a big front panel vent and no waterproofing, so it is for more arid climates where the temps are warmer. A jacket like this with an integral waterproof liner will perform great at keeping out water… there are no openings in that liner (such as vents, pockets, zippers, etc) that can be potential leak points. But a jacket with a fixed waterproof liner can’t be well vented. This one has two sleeve vents and a couple rear exhaust vents and those will move some air under the outer shell but the air flow will be over the inner liner and not all the way through to your skin. I’d suggest this jacket for those who live in cold to mild/warm climates and for those looking for very good waterproof construction. This jacket has an adequate number of pockets… two on the outside and one inside patch pocket (on both the liner and on the thermal liner so you’ll have it with or without using the liner). And the jacket can zip to compatible pants, or it has a loop in the back you can use to simply tie the jacket’s tail down to the belt on your jeans. This is a handy thing to prevent draft from blowing up the tail of the jacket and inflating it at highway speeds. The neck is adjustable with a two position snap arrangement and the collar materials are soft and comfy feeling and the arm circumference can be adjusted with snaps. And finally there are Velcro straps at the waist to tailor the fit around the waist/belly area.